17 years later, will the Pork Barrel scam end differently? A Twilight Zone moment. Or X-Files. Or Lost. Or Fringe. 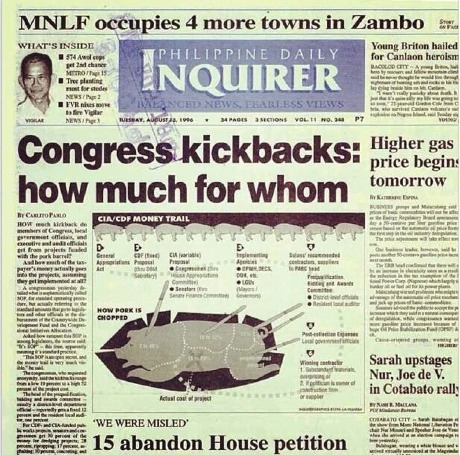 In 1996, the issue of the day was the pork barrel. How the Countrywide Development Fund (CDF) was being misused and stolen. The whistleblower died last month, and the issue rages on. How will it end this time? Will we just change the name again? From CDF to PDAF and now BUB (Bottom Up Budgeting)? Or some other combination of letters that mean the same thing? The Twilight Zone moment is the involvement of the MNLF in the issue. 17 years ago, at the same time, the MNLF stormed Zamboanga. Now, at the height of the PDAF scam, the MNLF stormed Zamboanga. I am not taking anything away from their struggle and their cause (though violence is never the answer), yet the coincidence is too much. Whoever is pulling the strings has a serious case of creativity-block. The funny thing is that no one remembered. Just one. Whoever came out with this first. Pinoys are notorious for having such a short memory. We get angry and riled up, but then forget everything. Look at all the coup plotters, pardoned plunderers, unfaithful husbands in Congress. We have forgotten what they did. Forgiveness is one thing. We can forgive. But why give them the opportunity to do it again? Will we forget now, too? Will we let them get away with it again? Will another whistleblower die after 17 years without the case progressing? Will nothing change? And will we remember this again 17 years from now when history repeats itself? If we do not learn from the past, we are doomed to repeat it. Previous Are the SK Elections > Freedom of Information? Next 2nd Year (out of 2!) NOMINATED for Catholic Mass Media Awards!